We were spending anywhere from $10, 000 to $35, 000 a day on traffic. My conversations with [these ad networks] were similar: They would let me decide how much I was willing to pay for traffic, and when I told them $0.002 or below, they made it clear they had little control over the quality of traffic they would send at that price. Quality didn’t really matter to us, though. As a website running an arbitrage model, all that mattered was profit, and for every $0.002 visit we were buying, we were making between $0.0025 and $0.004 selling display ads through networks and exchanges. 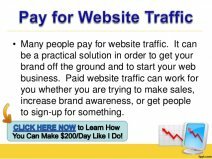 The biggest determinate of which traffic partner we were spending the most money with was pageviews per visit. Since we were paying a fixed cost per visit, more pageviews equaled more ad impressions. Almost none of these companies were based in the U.S. While our contacts were in the US and had American names and accents, most of the time we found ourselves sending payment to a non-US bank.